There are many things that need to go into building a retaining wall before the first shovel of dirt is ever moved. By using the information we have on building retaining walls you will get everything you need to plan, design and build the perfect retaining wall project. Use the plan/design menu above to check out all of the information we have on how to build a retaining wall up to 1.8 m high. 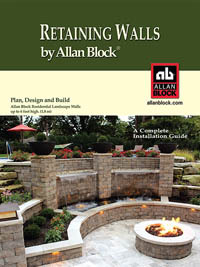 For walls larger than 1.8 m use the information on large retaining walls.